Inexplicata-The Journal of Hispanic Ufology: Spain: Remembering the "Incident at Palomares"
Angel Rodriguez, director of Spain’s GEIFO research organization, has written to tell us that the Antena-3 network will be broadcasting a documentary tonight (04.20.09) on the famous “Palomares Incident” of the 1950s, when a B-52 bomber collided with a still-unknown object over the Mediterranean, dropping its cargo of nuclear bombs into the water. 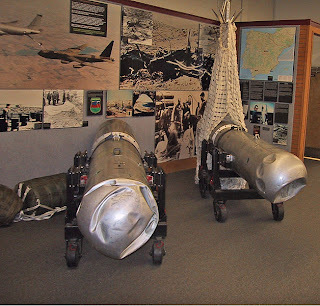 I’m taking the liberty of adding a few paragraphs of an article I wrote on the subject 14 years ago, and attaching some of the photos that Angel has so kindly shared with us regarding this event: four of the missing nukes were found; a fifth remains unaccounted for. “Captain Charles Wendorf's orders were straightforward enough: fly his B-52 Stratofortress to the Saddle Rock Mid-Air Refueling Area to meet a KC-135 tanker. The clear skies over the Mediterranean coast of Spain made Saddle Rock a particularly suitable refueling site. The giant aircraft, an element of the 68th Bomber Squadron out of North Carolina, was in the middle of a long patrol of the Atlantic Ocean, coming as close to the USSR as they dared. But Cold War tension would be the very last factor to affect the B-52's fate. “At 10:22 a.m. on January 17, 1966, at an altitude of thirty thousand feet, Captain Wendorf's nuclear-warhead laden Stratofortress sighted the KC-35 some 15 miles ahead in the refueling zone. The B-52 carefully jockeyed into position behind the tanker to connect with its refueling mast--a complex but efficient operation that did not involve any loss in speed on the bomber's part and in which remarkably small amounts of fuel were lost. “But something went wrong. An unseen force bumped against the bomber's underside, pushing it upward and causing the KC-135's starboard wing to graze the B-52's cockpit. The bomber's crew felt another terrible jolt as their plane rammed into the tanker's fuselage. “To observers on the ground witnessing the refueling maneuver, the tanker exploded into a ball of orange flame while both military aircraft disintegrated high above the earth. The long-range bomber's crew managed to jump clear of the explosion and were later rescued by Spanish fishermen after having miraculously survived their high-altitude jump. But four hydrogen bombs now lay at the bottom of the shallow coastal waters, and the efforts to retrieve them before lethal gamma radiation spread throughout the sea made headlines worldwide. “Witnesses to the explosion claimed having seen three objects in the sky at the time of the explosion, although only the downed bomber and the disintegrated tanker should have been in the area. 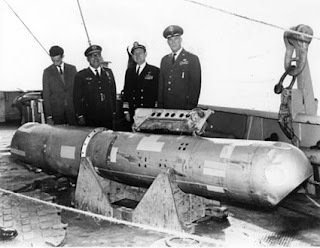 Suspicions arose among the Spanish military elements assisting with the rescue efforts that the USAF's frantic search for the missing warheads was, in fact, a thinly veiled excuse for finding the elusive third "airplane" -- the UFO that had caused the destruction of its aircraft and then disappeared without a trace. “The USAF had good reasons, perhaps, to worry about a force inimical to its interests somewhere over the Mediterranean: Eight days before the Palomares debacle, a colossal fireball of unknown origin had flown over the Italian cities of Capri and Naples, causing a general blackout. Four years later, in October 1969, two jet fighters would disappear without a trace during NATO exercises held off Crete. The previous year, the French air force had lost two Mystére IV fighter-bombers on routine patrol over Corsica. The result of the military inquest was that both planes were lost due to "undetermined causes".